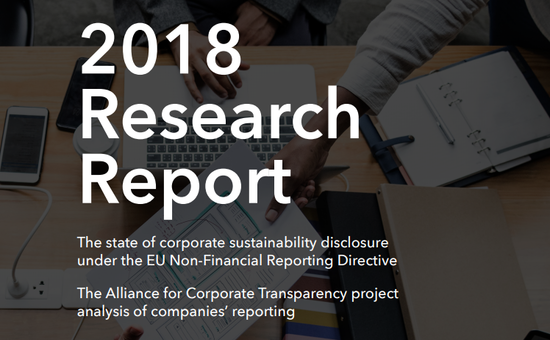 A new report published today by the Alliance for Corporate Transparency Project – of which CORE is a member – shows that companies in the UK and across Europe are failing to report meaningful information about their impacts on society and the environment. In 2018, companies across the EU were required by law to provide this information in their reports for the previous financial year, for the first time – as a result of the EU’s recent Non-financial Reporting Directive. This year, the project assessed over 100 companies from the Energy, ITC, and Health Care sectors. The initial findings point to one overarching conclusion: most companies acknowledge in their reports the importance of environmental and social issues, but more often than not this information is not clear enough in terms of concrete issues, targets and principal risks. Over 90% of the companies surveyed express in their reports a commitment to respect human rights but only 36% describe their human rights due diligence system. Similarly, 90% of companies report on climate change, but merely 47% specify clearly what precisely their policy has been designed to achieve and how. British companies were least likely to provide information on specific issues and targets in the disclosure of their climate policy, with the exception of CEE companies. 48% of them did so, compared to 50% of French, 62% of German, 63% of Spanish, and 67% of Nordic companies. Similarly only 20% of British companies from the Energy and Resource Extraction sector described their strategy to manage risks facing them as a result of climate change or the transition to a zero-carbon economy. As regards human rights reporting, 36% of British companies didn’t disclose any risks, more than companies from any other region. It is also worth noting that British companies mentioned forced labour in supply chains more often than was average, but 28% of British companies did not mention it at all, despite the reporting requirements of the UK’s Modern Slavery Act 2015. The results show that companies are acknowledging that social and environmental issues such as climate change are important to their business, yet not providing meaningful and clear information for investors and other stakeholders. “To ensure comparable and meaningful disclosure by all companies the legislation needs to be clearer” said Filip Gregor, the project coordinator. Without adequate standards or sanctions to hold companies accountable, the EU NFR Directive lacks teeth. The EU now has an opportunity to clarify minimum reporting requirements and move towards regulations that mandate human rights due diligence and hold companies liable for abuses that occur. You can download the full report here and visit the project’s website displaying the most relevant data here. A press release with a summary of the main findings is available here.